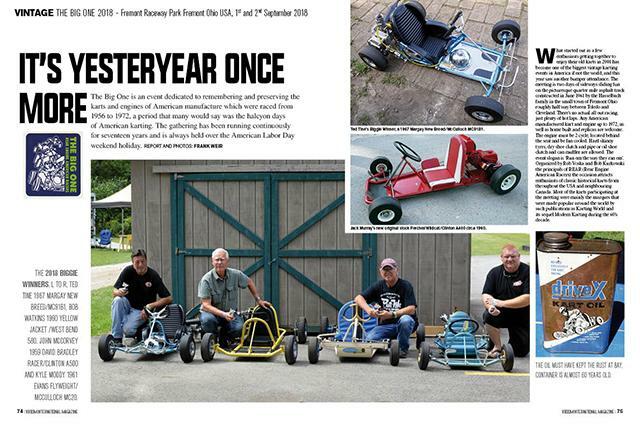 Big shout out to Mr. Frank Weir for once again doing a bang up job on reporting the 2018 running of THE BIG ONE in the pages of Vroom magazine. We have said it before and we will say it again that it is no small feat to get into the pages of Vroom and with out Frank's commitment to help to keep Kartings history alive this would not be possible. Thank you again Frank for all you do for the hobby of Karting and especially historical karting. We would also like to Thank all who attended T.B.O. and support the hobby of historical karting in general by keeping a running record of the days gone by out on the track. Your efforts and dedication are deeply appreciated by all. Here's is a little sampling of Frank's write-up.